Thanks to a $14.5 million National Science Foundation grant, Professor David Nice and his team of student researchers may be one step closer to understanding one of the mysteries of the universe. Nice is part of the North American Nanohertz Observatory for Gravitational Waves (NANOGrav), an international group of physicists exploring the existence of gravitational waves through the observation of pulsar stars. According to Nice, gravitational waves are ripples in spacetime produced by massive moving objects, such as super-massive black holes orbiting each other or remnants of cosmic inflation, the period just after the Big Bang. They are a prediction of Einstein’s theory of relativity, but have not yet been directly detected. The team uses radio telescopes to observe millisecond pulsars—distant, rapidly-rotating stars that emit pulses of radio waves. As pulsar signals travel through space from the pulsar to the Earth, gravitational waves affect their motion and the signals can end up arriving at telescopes a little earlier or a little later than they otherwise would. 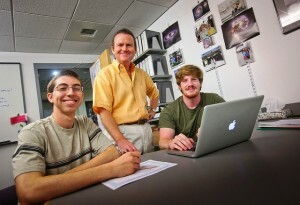 Nice and his students do this by gathering data using the Arecibo Observatory in Puerto Rico and the Green Bank Telescope in West Virginia, which can be operated remotely using computers at Lafayette. They then model when the pulses should arrive at the telescope in the absence of gravitational waves and compare that to the actual arrival. “The NANOGrav project provides tremendous opportunities for students to experience cutting-edge research and to develop and hone their data analysis skills,” he says. Sarah Henderson ’16 (Moon Township, Pa.), a physics and math double major, and physics majors Hao Lu ’16 (Wuhan, China) and Enia Xhakaj ’17 (Vlore, Albania) are working with Nice through the EXCEL Scholars undergraduate research program. They are focusing on improving the models of radio pulsar emission patterns to achieve higher-precision measurements of pulse arrival times. Physics major Allison Matthews ’15 (Gorham, Maine) is doing her senior thesis using NANOGrav observations to measure distances and velocities of millisecond pulsars. The goal of her work is to get a better understanding of this specific population of the stars—how they were formed and how they are distributed in the galaxy. Funding from the Physics Frontiers Center grant will be split among the group’s members, including California Institute of Technology, Cornell, Franklin and Marshall, Montana State University, Oberlin, Universities Space Research Association and NASA’s Goddard Space Flight Center, University of Texas at Brownsville, University of Wisconsin-Milwaukee, West Virginia University, and the National Radio Astronomy Observatory. Lafayette’s portion is $675,000.